Whist is a classic English trick-taking card game which was widely played in the 18th and 19th centuries. Although the rules are simple, there is scope for scientific play. Originally it was a gambling game played in clubs and coffee houses. Whist is a descendant of the 16th century game of trump or ruff. The game takes its name from the 17th century whist (or wist) meaning quiet, silent, attentive, which is the root of the modern wistful. Whist is first described by Charles Cotton in his The Compleat Gamester, published in London in 1674. It appears again in Seymour's Court Gamester of 1719, and we know that whist was played in some coffee houses in London. About 1728, a group led by the first Lord Folkestone played in Crown's coffee house in Bedford Row, London. They began to develop its potential as a partnership game. Edmond Hoyle tutored wealthy young gentlemen in the game and published A Short Treatise on the Game of Whist in 1742. It became the standard text and rules for the game for the next hundred years and helped the game become fashionable. There are over 150 editions of this little book. 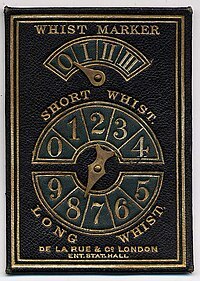 In the 1890s, a variant known as bridge whist became popular. It evolved in stages to become contract bridge in the late 1920s. The traditional game of whist is still played at social events called whist drives. Unlike contract bridge, there is no bidding process, and trumps are decided by cutting a deck of cards. Therefore the game can be played by people who know nothing about modern bridge bidding. The rules are how it is played; the etiquette is how the players should behave. A standard 52-card pack is used. The cards in each suit rank from highest to lowest: A K Q J 10 9 8 7 6 5 4 3 2. Whist is played by four players, who play in two partnerships with the partners sitting opposite each other. Players cut or draw cards to determine partners, with the two highest playing against the two lowest. The players then cut for deal. It is against the etiquette to comment on the cards in any way. One may not comment upon the hand one was dealt nor about one's good fortune or bad fortune. Many basic ideas in card-play were discovered by whist players, and survive today in contract bridge. Signalling between partners by means of the card-play was well understood and used. Examples are: leading the top card in a sequence, such as K from KQJx, and also leading 4th highest from any suit. In 1834 Lord Henry Bentinck invented the "high-low" signal, which encourages partner to continue the suit. Even advanced ideas were known. Alexandre Deschapelles (1780–1847), a French genius at both cards and chess, invented a play now known as the Deschapelles coup. It is the sacrifice of a high-ranking card to get entry to partner's hand. The technique of running events where all players sitting in the same direction play the same cards was invented for whist. A duplicate whist drive has placings N/S and placings E/W. Modern movements for contract bridge events are developments of that duplicate whist system. The basic movement was invented by John T. Mitchell, a Scot who moved to the U.S. He invented the boards which hold the cards, and the movement for whist drives, in the 1890s. In the basic Mitchell movement all N/S pairs sit, while E/W pairs move one table up each round. When they move, boards go down one table. The effect of this is to divide the tournament into two halves, but later movements can avoid this. By allowing many pairs to play the same set of boards, tournament whist was invented. The idea, with variations, is still used today for bridge tournaments. ↑ Harbin, Robert 1972. Waddingtons family card games. Pan Books, London. ↑ Phillips, Hubert 1960. The Pan book of card games. London: Pan. ↑ 3.0 3.1 Pole, William 1895. The evolution of whist. London: Longmans, Green. ↑ Rather, John C. & Goldwater, Walter 1983. According to Hoyle... 1742–1850. New York: University Place Book Shop. ↑ Hellespont". 1901. Hellespont on bridge. The laws and principles of bridge stated and explained and the practice illustrated by means of hands played completely through. London: De La Rue. ↑ 10.0 10.1 10.2 Francis, Henry G (ed) 1984. The official encyclopedia of bridge. 4th ed, ACBL. New York: Crown. History of bridge p175; Mitchell movement p286; Deschapelles p599; John T. Mitchell p688.